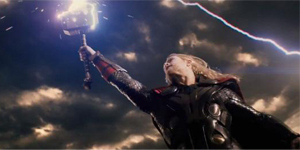 Here’s the latest trailer for Thor: The Dark World, and it’s epic to say the least. We have action, romance, and of course, Loki. It’s great to see the original cast back and it looks like we’re going to get some great new shots of Asgard and the worlds beyond. I find Thor’s story and his world to be the most fascinating in the Marel Universe thus far. It’s a world where magic, giants, and gods are normal everyday things. Check out the trailer for yourselves. Thor: The Dark World opens November 8, 2013.